Looking up at something I did not know what it was,was 3 orange lights. Flying next to each other and the splitting up. They were very high. I got to my destination came outside and took a smoke break, looking up I see those lights again, knowing that it can’t be a plane coz there’s no noise and also it’s couldn’t be a plane coz the planes that do come there is low and preparing to land so it’s a restricted area. I looking at this what I don’t know what it is, I ask the people that’s looking at it with me what the hell it is. Up till this day I never have found out what it is …. But I made sure I made the best out of that opportunity I took out my phone and captured it on video! Normally I can see a star outside my bedroom window clearly every so often in the same position, but for a few months in 2017, there was no sign of the star. One night I was working late and crawled into bed at about 12:30, after which I decided to take a look out the window to see if I could locate the star. All I ended up seeing was a green and red flashing orb/UFO. Initially, I thought nothing of it until it dropped out of the sky at an extremely fast rate and then back to its inital position. I was sure this wasn’t a satellite or plane, as the action was too linear and the recovery back to its initalh position happened too fast. The lights then changed to white and it would slowly drop every 30 minutes or so. Every night after the incident I would check whether or not the object would repeat its action, but the object was no longer in sight. Exactly 3 nights later, the orb reappeared and slowly jolted up and down every so often at the same time (01:00 AM), but this time the orb changed its flashing light colouration a few times. 2 nights later, the orb was no where in sight, but there was a deep humming and droning noise over my house at around 01:00 AM for 30 minutes before it stopped. got footage while filming lightning… UFO appears twice, close up with sound of sound of craft, extremely clear footage with good sound… extremely fast but on replay and pause clear as daylight…normal human would not spot it, was only evident when I looked at video on PC… what I have is real untouched footage… my email. bernardhughes777@gmail.com as I am in 2 minds, this Is research,,,material… no doubt. I am protective over the footage. Driving down the road my wife and I saw an orange orb the size of a golf ball moving horisontally over the horizon. It moved fairly quickly with no other lights present other than orange. It then moved from its horizontal trajectory to a vertical trajectory towards the ground. At which point it fell out of visibility behind a tree line that was next to the road. I moved the car further down the road in hopes to see where it went but by this time it was gone. I was down at the beach promenade taking a walk when I saw one bright star in the somewhat-clear-night-sky that seems a little odd compared to the others. I could not see a specific shape, but if I had a telescope at the time, I could have had a better way of describing it. What was odd about this ‘star’ was that it made tiny, quick movements that happened every few seconds. From where I was standing on the promenade, the movements were no more than a centimetre in lenght to the left or right of its current position. There was no sound to it, and it was not a drone. This ‘star’ moved unnaturally fast for it to be confused with any of our current technology satellites either. A better way to describe its movements was that it zipped from left to right, up and down effortlessly. It had geometric movements, either horizontally straight or at an angle. After a few minutes passed by, tiny flashes of light started to appear about half a centimetre around the ‘star’ and they happened to be coming from the right side of the ‘star’. It was almost as if the ‘star’ was trying to avoid being on the same path as where the tiny flashes of light were appearing. Hence, it appeared as if the ‘star’ was moving out of the way of the tiny flashes of light. This went on for about a minute or so before the tiny flashes of light stopped and I gave up staring at the strange sight. I checked on the star a few times while I was walking on the beach promenade and noticed that due to earth’s rotation, it ‘moved’ along with and stayed its position in relation to the other normal stars. To be sure that it wasn’t just my eyes that were playing tricks on me while looking at the ‘star’, I used two stationary objects nearby as my grounding point to look at the ‘star’. These two objects were hotel buildings. I know the ‘star’ moved. I just need to know if anyone else has more information about this. Sorry, I unfortunately do not have any images as proof. Although I do have a few eye-witnesses that saw it too. It’s quite weird to report this because logic tries to dismiss it. I was out in my garden with my family when I saw a white/silvery sphere in the sky. I figured it was pretty high because it actually went behind cirus clouds and was moving against the direction of the clouds, so I don’t think it was a balloon. My wife actually spotted another object the same description in the same area between the same cloud. Ended up seeing 3. About 10 minutes later I saw another object much brighter moving slowly overhead. My initial thought was that it was a kid playing with a drone over our house. But I realized it was too high. And the object didn’t have any discernible shape- sort of round, sort of “cigar” shape. It also seemed to twinkle between silver, green, black. I thought it was a balloon. I called up my brother who lives about 4km away. He could also see them. He looked through binoculars and said it seemed to be changing shape and the colours were not reflected but seems to be emitted. All in all we had 5 witnesses to this sighting. I took some pics with a cell. Not great but it’s there. On Friday evening, the 8th of December 2017 at around 9pm I saw a large bright red-orange light moving in the sky. 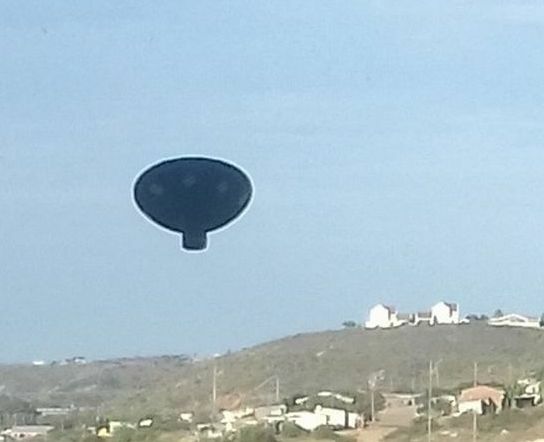 It appeared to be flying quite close to the Earth and came from the direction of Gordon’s Bay and went towards the Helderberg mountains. It was moving slowly and didn’t make a sound. I was watching it and wondered if it could be a plane and with that thought the light slowly grew dimmer until only a spark was left and the light disappeared. Then we saw a rather large grey sphere shaped object continue its course straight across the sky. We clearly saw it and watched it until it went out of sight. I did not perceive it to be an asteroid, nor was it a plane. It had no tail and there was no explosion. It was not dropping from the sky like a flare, but steadily moving horizontally. I was amazed at how clearly I could see the round grey shape in the dark travelling forward.